A Salesforce-United Way Partnership and Platform that Inspires, Connects, and Empowers Social Change. The United Way of Greater Knoxville, founded in 1922, has long partnered with many companies in the Knoxville area to improve our community. We enter workplaces, hold campaigns, raise money, and give it right back to the people and agencies in Knoxville that need it most. Our community is evolving, and that means our ways of giving, advocating, and volunteering are evolving, too. That’s why United Way of Greater Knoxville is teaming up with Salesforce to bring Philanthropy Cloud, and the future of philanthropy, to our community. To you. What is Salesforce Philanthropy Cloud? And now, it’s available through United Way of Greater Knoxville. What Can Philanthropy Cloud Do for Your Company? Corporate social responsibility is becoming more and more imperative in today’s workplace. Today, a company’s community involvement can determine how well they recruit new employees, engage ones they already have, and strengthen customer relationships. 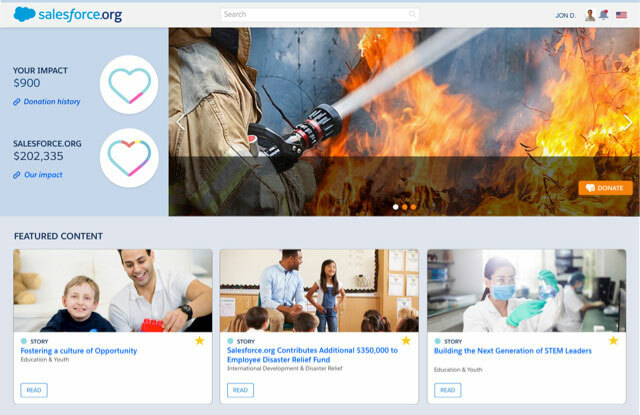 Salesforce.org Philanthropy Cloud allows employees to drive and fulfill giving campaigns, and connects their individual interests to the right opportunities to give back in their community. Give your staff the power to give, advocate, and volunteer for the causes they’re passionate about. Woud you like to learn more about Philanthropy Cloud?